Boston's Best Seafood Restaurant approached me about designing their drink menu. 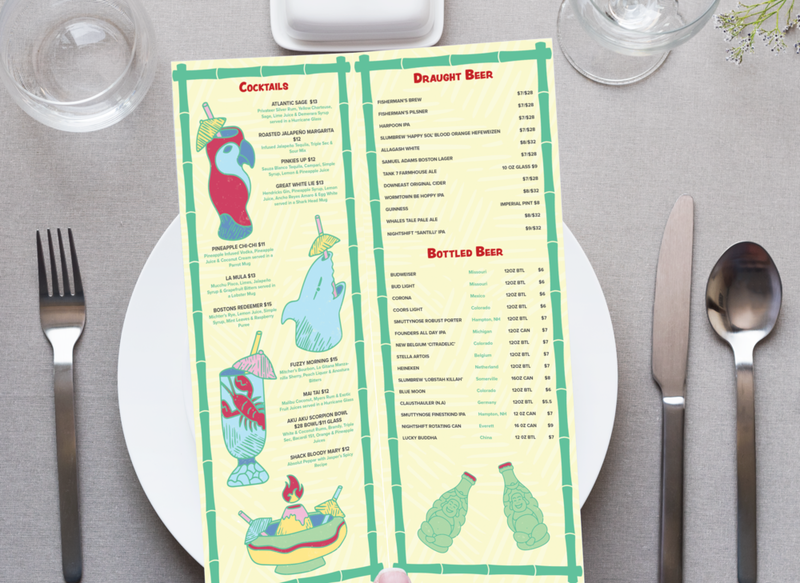 I designed this tiki inspired design to coincide with their brand, utilizing their brand colors and personality throughout the menu. The drinks are hand drawn illustrations of their fun and unique drink glasses. I was asked to create a brochure for Summer Shack Back Bay's Special Events. The sales kit's purpose is to provide potential bookings all the information about special event options at the venue. The sales kit has a New England vibe putting the seafood the forefront of the branding. Ad Design for Summer Shack Back Bay in Where Boston Magazine. Summer Shack wanted their chalkboard design made into a daily menu cover. They print this menu daily with their specials for the day. After seeing Summer Shack Back Bay's Drink Menu I was approached from the Mohegan Sun location to do their menu. They wanted more custom illustrations of drinks to go throughout the menu.